Franck Muller is enriching its men’s collection with this latest incarnation of the Vanguard – The Vanguard Grande Date, a piece that stands out with its strong and noticeable features. The architecture of the Vanguard Grande Date is very strong and emphasized by the power of its open dial and the flawless proportion of its curves. The sporty personality of this timepiece is demonstrated through its openworked dial which aspires sophistication and modernity. Wholly manufactured in-house, all the components of the movement have been hand-bevelled, circular-grained and decorated with Cotes de Genève stripes. 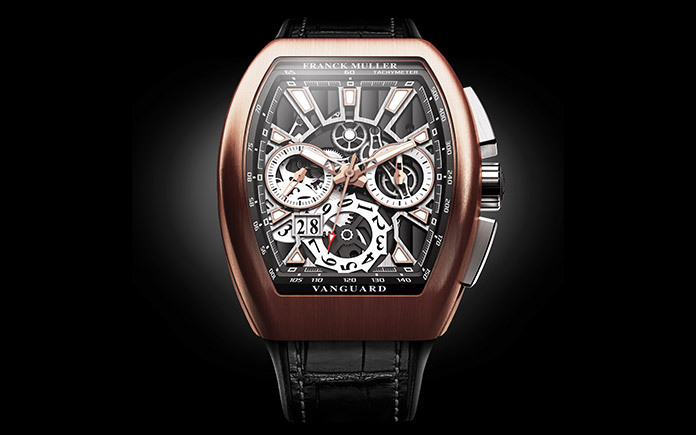 The Vanguard Grande Date expresses the innovation, performance and craftsmanship values of the Franck Muller manufacture. Aesthetics meets technical attributes in this wristwatch displaying a circular chronograph, a minute counter at 3 o’clock, a second counter at 9 o’clock and a big date at 7.30. At the heart of this piece beats an automatic movement offering a power reserve of 46 hours. Available in titanium, stainless steel,18 carat rose gold and carbon, this new line is delivered with a leather and rubber strap or a nylon and rubber strap.